UDM Downloads > Recover FAT Drive! Hard disk FAT partition data restoration software is cost affective application to restore your precious and essential deleted data, pictures (jpg, bmp), damaged audio, video (mp3, mov), corrupted text documents (txt, doc) and formatted excel files folders from FAT file system. FAT files retrieval software quickly retrieves corrupted FAT tables, accidentally deleted data from bad sector affected hard disk. FAT data recovery software is an effective and time saving program to recover whole data which corrupted due to virus attack, unexpected system shutdown, power failure or other similar reasons. FAT partition data salvage tool completely scan your undetected drive and provides facility to thumbnail preview of all files before actual recovery by using standard or advance search option. FAT partition retrieval program is very easy to install and uninstall on all windows operating system including windows 98, 2000, XP, ME, NT, windows Vista (Starter, Business) etc. Vista FAT data recovery software fully supports all major brands of hard disk including Sony, Samsung, IBM and many more. Advance FAT data restoration tool is time saving application to retrieve selected or complete data records from undetectable hard disk supported by FAT file system. Features: * Windows FAT data recovery tool recovers erased photo files and deleted audio, video clippings lost due to overwritten of data records or formatted hard disk partitioned. 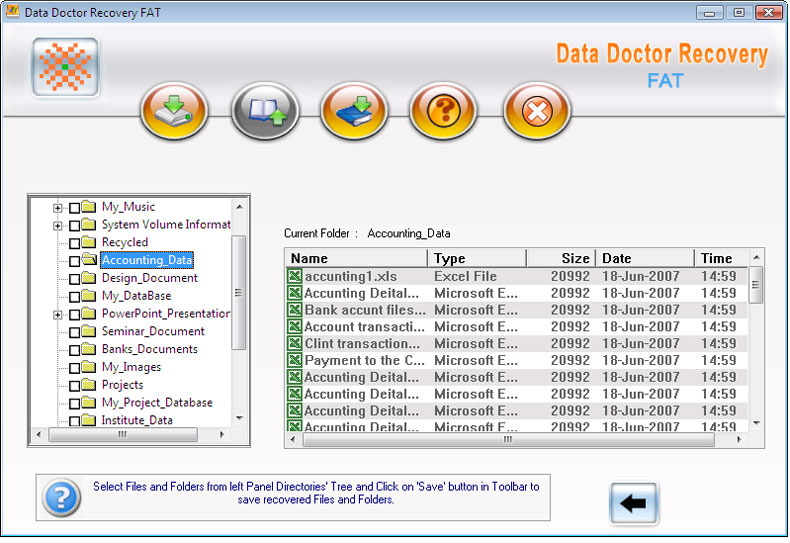 * FAT data restoration utility provides interactive GUI to backup office document, compressed, zipped files folders and saves all data in safe place. * Vista FAT data retrieval tool is capable to restore unidentified data files even if hard disk failure message is being displayed on desktop /laptop computers. * Hard disk FAT data salvage application retrieves unrecognized FAT tables, subfolders, directories from crashed hard disk.